You have found the 'Archiery' Ardbeg Day game card that is part of the Ardbeg Day online treasure hunt. Click on the card below to jump to the 'Official Ardbeg Day' website, and you can read about the latest news, events and games available on Ardbeg Day. Don't forget to DOWNLOAD the card and collect them all to win cool prizes. All cards must be collected and sent in by June 7th so get moving. See rules HERE. If you came across this page without prior knowledge of the treasure hunt, simply click on the card to get more information about the hunt and start looking for more cards. Since the beginning in 1984, the Islay Festival (also known as Fèis Ìle) has been a tradition on Islay during the last week of May each year. This event, more affectionately known as the Islay Festival of Malt & Music (or Music & Malt) has grown astoudingly, and since 2000, the distilleries of Islay and Jura have actively participated, with each distillery having an 'Open Day', now spilling into the first few days of June. Traditionally, Ardbeg has held the last Saturday of the event as the Ardbeg Distillery 'Open Day', and though the fine folks at Ardbeg would like everyone to join in on the festivities, Islay just isn't big enough for all the Ardbegians around the world. It is also impossible for fans to make the trip every year so Ardbeg decided they would like to make this a global celebration. Now, in order to share not only this day, but also the whisky and the events, Ardbeg has proclaimed June 2nd, 2012 as Ardbeg Day with specially themed Islay-limpics for all to enjoy. In addition to the distillery on Islay, there will be over 100 Islay-limpic events happening all over the world. Whether it is at the distillery, an Ardbeg Embassy or a specially scheduled event, and if you are of legal drinking age (of course), you can taste Ardbeg Day on June 2nd. If a small taste is not enough, bottles of Ardbeg Day will go on sale that day as well. While you may need to conduct a treasure hunt to find the outlets selling 'Ardbeg Day' Single Malt Whisky, we have no doubt that Ardbegians will triumph in their search. Now go forth, and celebrate 'Ardbeg Day'! What is ARCHIE(RY)? Who started this infamous Ardbeg Day event? How can I participate in ARCHIE(RY)? Game: A close cousin of the game of darts, this event is played outdoors to allow multiple arrows to be thrown at passing whisky barrels (i.e. do not play at home). 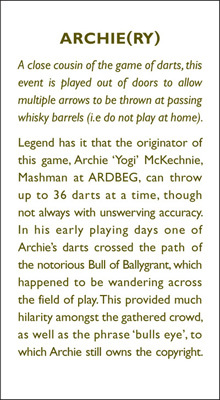 Creator: Legend has it that the originator of this game, Archie 'Yogi' McKechnie, Mashman at ARDBEG, can throw up to 36 darts at a time, though not always with unswerving accuracy. 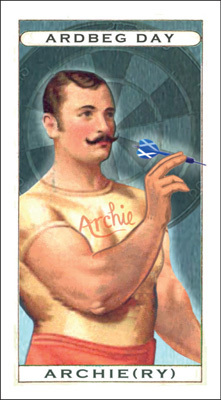 In his early playing days one of Archie's darts crossed the path of the notorious Bull of Ballygrant, which happened to be wandering across the field of play. This provided much hilarity amongst the gathered crowd, as well as the phrase 'bulls eye', to which Archie still owns the copyright. Ardbeg Project thoughts on participation: This event is best enjoyed, and observed, from the sidelines where you can sit back, relax, and enjoy a fine measure of Ardbeg Day Single Malt Whisky. If you can't find the Ardbeg Day celebratory whisky in time for the events, and as it is best to keep 'roaming beasts', 'stellar explosions', 'fast moving rail cars', and 'hungry swamp creatures' away from the field of battle, I might suggest a soothing, and easily available, Ardbeg Uigeadail for your spectating tipple. However, any Ardbeg would be suitable for ARCHIE(RY) watching. WARNING: While attending an ARCHIE(RY) event, remember to always watch out for vengeful Ballygrant Bulls. If you are not a Committee member, and you would like to receive updates on Committee Events and Ardbeg news, join the Ardbeg Committee at your nearest Ardbeg Embassy or at 'The Official Ardbeg website'. Then, you too can try the inaugural glass-lifting event* with us all. STEP 1: Select a glass. STEP 2: Open a bottle of Ardbeg. STEP 4: Lift glass to lips and sip.